VPN, or virtual private network, is a secure method of connecting remote internet resources together as if they were under the same LAN. 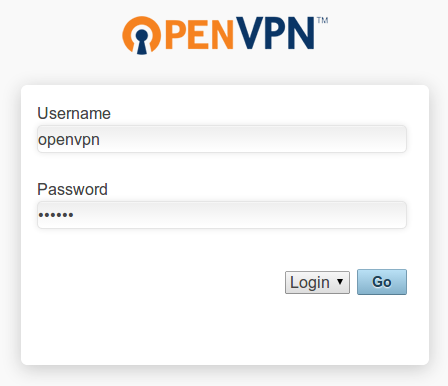 OpenVPN is a popular implementation that works on Linux, Windows, and Mac operating systems and can be utilized to create complex, encrypted networks between physically dispersed servers. 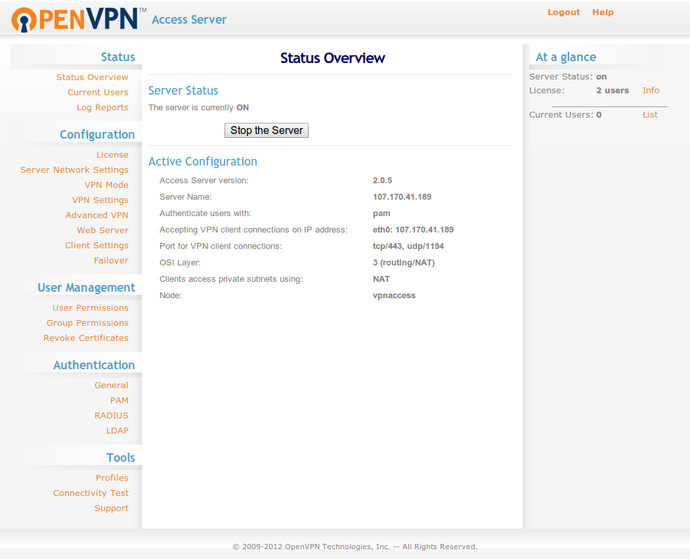 The OpenVPN Access Server is a solution built on top of traditional OpenVPN that is used as a complete portal for managing connections, users, and interfaces. It provides the underlying VPN instance, a web interface for managing the suite, and a client that can be used within a web browser. In this guide, we'll install and configure the OpenVPN Access Server on a CentOS 6.5 VPS instance. We can obtain the OpenVPN Access Server package for CentOS from the project's website. Right click on the package that matches your version of CentOS and your machine's architecture. Select the "copy link address" item or whatever option is closest. 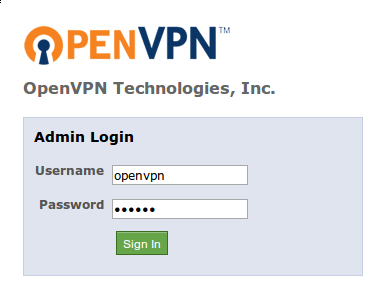 After installing the package, an administration account is created called openvpn. However, no password has been set. Now, the command line configuration steps are complete. The rest of the guide will focus on configuring options through the web interface. We can access our VPN portal by going to our server's IP address or domain name, at port 943. The server operates using TLS, so we will need to specify the https protocol. This is expected and perfectly fine. All that this is telling us is that OpenVPN is using a self-signed SSL certificate, which is not trusted by default by our browser. We can click on the "Proceed anyway" button or whatever similar option you have. Delete the current configuration by typing DELETE at the prompt. Next, accept the license agreement and press ENTER to mark this as the primary server. In the next prompt, select (1) all interfaces: 0.0.0.0 to bind to all interfaces. This will ensure that the access server is available in spite of a bind error in the OpenVPN installer. Press ENTER to accept the default values of the remaining prompts. After reconfiguring, you should be able to access the web interface after accepting the SSL certificate in your browser. Here, you can configure your VPN server. The access server separates the web interface and the actual VPN access and each can be configured independently. For instance, if you go to the Server Network Settings in the left-hand menu, you will see a page where you can configure the port and interface that each component operates on. You can also specify the address pool that will be available to the clients. Another thing you might want to do is add users and configure the authentication methods. You can add VPN users that match your system users, or add users that you might be controlling through an LDAP server. 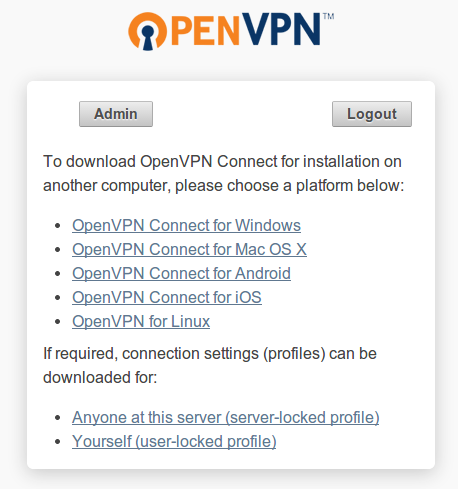 If your desktop is Windows or OS X, or if you have an android or iOS device, you can download an OpenVPN Connect client that will operate within your browser. If your desktop is a Linux machine, you will be asked to download the normal VPN client. Now, you should have a portal that can be used to configure your VPN access. This is an easy to manage interface that can be set up once and configured on-the-fly. It automatically generates valid configuration files for your users to connect to the server, which can save a lot of headaches with explaining how to configure access.